I went for a long walk late Sunday afternoon along the sidewalk that follows the contour of the reservoir. In places, the path is right next to the rocky shoreline, and in others the terrain between the path and the water’s edge is thinly forested with old growth pines and cherry, apple, and dogwood, and oak and maples, all blanketed by tall ferns and ground foliage. At this time of year, the ground plants are just beginning to sprout and the leaves on the bushes and shorter trees have not yet started, so there is a clear view through the woods to the water. Many creatures live there, and every walk I take seems to reveal more of them. Last night, it was a large cottontail rabbit. Saturday night, a lone goose that had gotten stranded on the wrong side of the path and needed some encouragement to dip beneath the guardrail to safety. Sunday, as I was walking, something made me stop suddenly and drew my attention to the right, into the woods and trees. From where I was at that moment about fifteen feet of thin, tall trees and underbrush sloped gently downward to the shoreline, and there, not ten feet away, stood a great blue heron. They are usually very shy and erupt into flight at the first sensing of an approaching human, but for some reason this heron remained stock still. We stood there, staring eye-to-eye for a long, long time, though it could not have been more than twenty seconds. His eyes, doe eyes almost, soft eyes, like those of a deer. His long break, the orange-yellow of Aztec gold. His cap feathers, pure white. It felt as though I was looking at a being of kindness and intelligence, and an equal. The silence between us was absolute. We stood there, eyes-locked, watching each other, absorbing in full stillness, and then he leaned forward and lifted skyward in absolute silence, not an audible rustle of feather in the unfurling of exquisite wings – just soundless, effortless flight. So, what does this story have to do with these photos? I used to do a lot of photographing in the mountains near Santa Cruz, with the vistas of mist-shrouded hilltop after hilltop marching to the Pacific, and along the Pacific Coast at sunset – hundreds of hours seeking to capture the perfect moment, until one day I realized I was missing the moment IN the moment by working so hard to preserve that moment for future viewing. Technology had gotten in the way of experiencing the moment in the now. What does this story have to do with these photos? It’s a lesson in our choice to be present in the moment, as I was with the heron that afternoon, instead of focusing on the technology of recreating that moment for the future. It’s a lesson in mindfulness. And the herons? They’re a study of Patience and Grace. Hi Babsje, Great Blue Herons are among my list of favorite birds. Your photographs are really wonderful. So glad I am reading your fine blog. Have a very nice day tomorrow! You’re welcome, and thanks for visiting here, too. Hello, Babsje! What a great catch (literally and figuratively). I’ll be looking at some more as soon as I finish typing here. Thanks, too, for visiting and liking my site; I’m so happy you stopped by! More later, ok? Coming back for another round, Babsje! As a great bird/birds of prey lover, I want to thank you for liking my posts, “Barred Owl in the Bog” , parts 1 and 2. It’s way to much fun doing this, isn’t it? I agree, way too much fun! Your owl photos are wonderful. I’ve never seen a live owl in the wilds, and so seeing vicariously through your post was a treat. So you decided to join the small clan of Uncle Spike followers Babsje…. That makes me a happy blogger now – I really appreciate you making that special mouse click. Thanks for your kind words, and you’re welcome! Thank you so much the Blogger of the Year award, I am very honored. If it’s ok, I’ll post about it later on during the week. Thanks. I have been also having a lot of problems with wordpress. Comments are going to my junk and I’m not able to leave comments. You’re welcome, good luck! FWIW, your comments to me here are coming through fine. Thanks, I have been having the problem on and off for more than a month. Thank you, I know I am not the only one. Since they changed the format of the reader, sometimes, I only see same 3 posts over and over again. The new reader won’t let me click the “like” button on many sorts of posts, sigh. Thanks, you have a good night, too. That too, I was trying to open a post yesterday, and it would not bring me to the post. Thanks for visiting and for your kind comment here! Well deserved for you and your blog 🙂 Personally, I have never seen lapwings trying to drive away a heron; I did see lapwings trying to drive away a sea eagle. Wow, a sea eagle? Those lapwings are feisty! Thanks again for your thoughtfulness. Enjoy the weekend. Thanks for sharing this link. Its almost magical, the number and variety of birds and animals captured on that outing, wow! Yes, Oostvaardersplassen is a beautiful area. I have nominated your blog for the Being a Light in the World Award. All the best for you and the herons! Well deserved 🙂 All my best wishes for you, your camera and the herons! Thanks so much, and same to you and your efforts at preserving the environment, and peace. Excellent reminder to us all! Happy (special) Anniversary! Thanks so much! Hadn’t thought of it as an anniversary before, but you’re right. I love the photos and I love your “about”…exceptional intention, gorgeous images, lovely writing. Thank you. Many thanks for your visit here and for your kind comments. I’m so glad you like the Great Blue Herons! What a delightful surprise and honor, many thanks for your thoughtful gesture! As I mentioned, your own blog balances concern for Both Nature and Man in a way not often seen, and is so often thought-provoking. Thanks again for nominating my blog. Your beautiful blog really deserves the award. All my best for it and you! You’re welcome, and thanks again for your thoughtfulness. 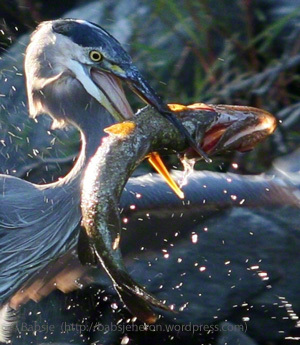 I love the outdoor photos of the Great Blue Herons and various wildlife. It reminds me of Southwest Florida. Thanks for your kind words, I’m glad you appreciate the Great Blue Herons. Curiously, while I lived in Southwest Florida years ago, I never saw a Heron there. Egrets, yes, but no Herons. In retrospect, that seems surprising! Wonderful photos. After reading this I see where you might consider a a trip to the South Carolina coast, February or March. The Heron rookeries are full and amazing. Thank you for finding dragonshades and leading me gently to your wonderful blog. I too have shared the magic of eye-contact with creatures of the wild and agree that although one could regret what one didn’t capture there is no regret in what captured me.